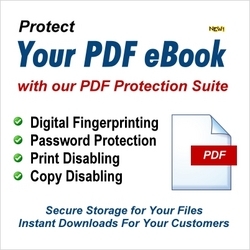 DigitalContentCenter.com has released the much-anticipated PDF Protection Suite, which helps protect pdf ebooks from theft and file sharing. DigitalContentCenter.com, a leading service provider that helps thousands of self-publishing authors sell and deliver ebooks has introduced it's newest feature, The PDF Protection Suite. The suite contains four independently operated protection features that authors control. Digital Fingerprinting, which imprints the purchasers name, full address, phone number and email address on the bottom of every page in the ebook. Automated Password Protection, which requires the purchaser to enter their email address when opening the ebook. Print Disabling, which prevents the purchaser from printing the ebook. Content Copy Disabling, which prevents the purchaser from copying text or images from the ebook. "Our PDF Protection Suite is the answer to many self-publishing authors digital prayers," explained Art DeVaughn, Director of Programming. "Ebook Authors can feel confident that their ebooks are protected and at the same time buyers are not locked to a single viewing device, it's a win-win solution." In addition to the PDF Protection Suite, DigitalContentCenter.com also protects all published material with an Automated Link Sharing Blocker as well as several other security features designed to stop sharing and theft. Visit DigitalContentCenter.com or call and talk with an ebook specialist for free at 865-686-5713. Service pricing for self-publishing authors won't break the bank. Monthly service plans cost $14.95, $19.95 or $24.95 depending on how much space is needed. Every account includes unlimited transactions, bandwidth and a plethora of features. A one-time activation fee of $19.95, which funds our unlimited telephone support for all clients, is charged at activation. The ability to sell tangible merchandise items like hardbound books, cd's and dvd's is also included. DigitalContentCenter.com (DCC) is a privately held Digital Content Delivery Service based in Knoxville, Tennessee and owned by Web Services Corporation Inc. The online service allows self publishing authors to sell ebooks, audio books, music or anything digital online directly to buyers from their own personal websites, blogs, or social media pages, and keep 100% of the royalties. Web Services Corporation (WSC) is a privately held company based in Knoxville, Tennessee. The company's devotion to making website application software began in 1996. Since then, WSC has been committed to providing solid applications designed to improve the way companies do business. Art DeVaughn is available for telephone, web cast, TV and radio interviews on the topic of Selling Ebooks. As one of the industry pioneers, Mr. DeVaughn is extremely knowledgeable about this exciting industry. Please call 865-686-5713 to schedule a complimentary interview.